Discussion in 'Ham Radio Discussions' started by N1KWW, Apr 17, 2019 at 4:44 PM. After watching several videos trying to fine the dimensions of loop antennas I have a gripe. When making a video I don't need to know the name of your cat, dog or any other non-related info. Long drawn out lengthy explanations reduce interest. Be succinct! When describing construction provide a list, including lengths, diameters and any pertinent info. Then proceed step by step from beginning to end. Sorry if this post wrangles some but felt something needed to be said. KD2EJ, K0UO, K4AGO and 2 others like this. My gripe of the day is not enough people on ssb. It's better than one thinks. And my dog's name is Rusty, I'm right handed, and I've had an artificial hip for 21 years. G8XQB, K0UO, VK4HAT and 1 other person like this. It could be said you get what you pay for. KE4OH, WA7PRC, W4NNF and 1 other person like this. Agreed, and through no fault of their own--other than ignorance* and/or laziness--most people don't know how to prepare/create a good presentation. It just goes to show that even if one has the tools (PowerPoint, Captivate, Camtasia, QuickTime, etc. ), it doesn't make them competent. If (collective) you have plans to make a vid, please enlist the aid of someone who can make it shine--it only reflects badly on you if you don't. *Ignorance in that they don't know better--not in an insulting way. WU8Y and N2EY like this. Why not find a well-made video from a credible source. Or, read a book for that matter. What qualifies the guy you were watching as an expert on loop antennas? This clown is doing a "comparison" between 4 receivers, but he only has the DSP engaged on 2 of them. The Contour is engaged on one of them. Sadly, I'd be willing to bet this video influenced a few hams decisions when they purchased their rig. 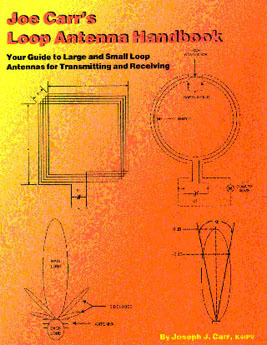 My favorite loop antenna book. K0UO, KI4AX and WA7PRC like this. I'll give them credit in that at least they tried. But I get tired of endless chatter and lengthy intros about nothing in some instructional videos too. I just want the basic info "cut to the chase" as they say, but I guess that is not so much a fun way to make a video about something. Why not find a well-made video from a credible source. Or, read a book for that matter. We don't always know who/where that credible person or well made video is. Might have to go through a few to find a good video. Books? YES! Still the best thing ever but not always handy for some things. For ham radio you can't have too many! WU8Y, W4IOA and N2SUB like this. My gripe of the day is not enough people on ssb. It's better than one thinks. But some of us believe AM is better. It's certainly easier on the ears. We don't always know who/where that credible person or well made video is. True. There are well-known hams that are widely followed on YouTube, but not everyone knows about them without a little trial and error. Good point. I think some of these guys think they are building a brand by talking about their dog Spot (h/t Cal Worthington) or other useless prattle. I'd rather they get to the point and be done with it. I also don't understand 'unboxing' videos. Who wants to watch someone pull a new radio out of a box and comment on how well it's packed? K0UO, WU8Y, N5PAR and 3 others like this.